Hola Pepsi Cola was created by a group of unicorns and one non believer. 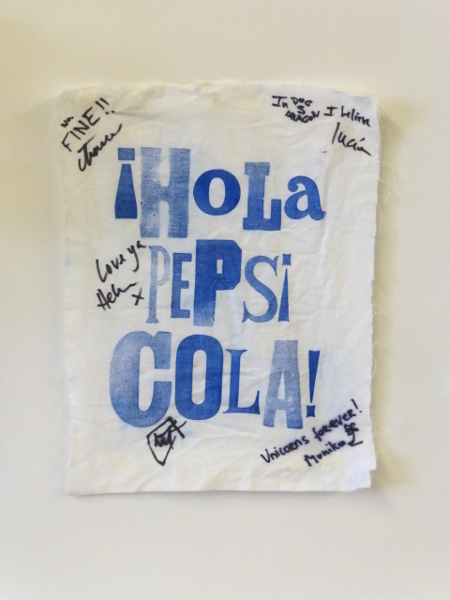 The Hola Pepsi Cola group would meet every lunch time outside the town hall and share stories, food and laughter. There was always a lot of love shared especially to the unicorns. Everyday each member would bring a story or two, these stories would be folded and picked out of a hat and we would discuss/debate. Personal favourites would include Conspiracy Theories, films, politics, religion, cakes, biscuits, rude words for male and female parts. As individuals we were lonely lost souls. Together we were one, we were strong, there was nothing we could not debate or discuss. When out time had come we had our favourite Grassington Festival sayings published and signed by each founding member. Every day I have used this to wipe my tears from my eyes until June 12th when the Hola Pepsi Cola group made a comeback.